Okay... As much as your mum would probably be happy enough with a phone call or a visit, we still think: Why not go the extra mile and shower your mum with gifts (only if you have the budget, of course). Considering how much they have spent on us since baby to adulthood, giving them gifts a couple of times in a year is nothing, really.. :) This is just ONE WAY of showing them how much you appreciate and love her. It would be nicer though if we remember to spend time with our mums the other 364 days in a year. 1. 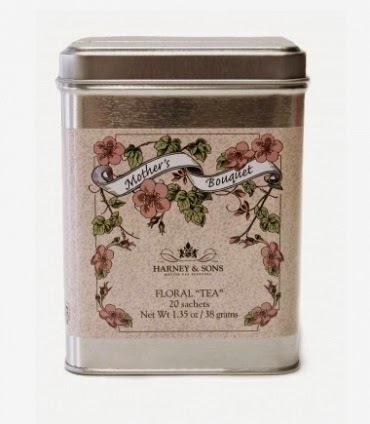 Mothers Bouquet Floral Tea by Harney & Sons Master Tea Blenders New York. This is a beautiful, refreshing caffeine-free cup; chamomile flowers blended with rosebuds, cornflowers, and orange peel, infused with citrus flavour. Tin contains 20 luxurious pyramid silken sachets of the finest herbal blend. You can also host a Mother's Day Tea Party with this Floral Tea , to make mum extra special. Invite your aunties, cousins, basically the whole family and enjoy time together with your loved ones. An exquisite set which contains an ultra nourishing Hand Therapy & Body Lotion. As an added bonus, it comes in a beautiful gift box with gift tag. Formulated with certified organic ingredients & pure, gentle essential oils, this stunning set is guaranteed to make a truly sophisticated gift for Mother's day. Comes in a beautiful gift box with gift tag. This gift set is the ultimate in fragrant treats for the body. Included is a travel size Petit Parfum, a Creamy Vegetable Soap with moisturising Cocoa Butter and a nourishing Lip Balm for super soft lips. And there you have it, our most popular gift range suitable for any range of budget.